A couple of my friends and I haven’t had Japanese ramen for a while and so the solution? None other than Shoryu ramen for yesterday’s dinner! Plus, it was cold and rainy then (what’s new?) so nothing would have been better than a steaming bowl of delicious ramen broth. Yum! We arrived at about 7.30pm and had to wait roughly 30 mins to get seated. Yes, when a place is this busy on a Monday night, you know it’s good stuff. Currently, they have a Christmas set menu as pictured above which consists of either a starter or a dessert with a bowl of ramen for £20, or £30 for both the starter or dessert. All of us chose the starter + ramen as it made the most economic sense: the dessert in the menu (macha cheesecake) costs merely £4.50 while the starter definitely costs more than £8. 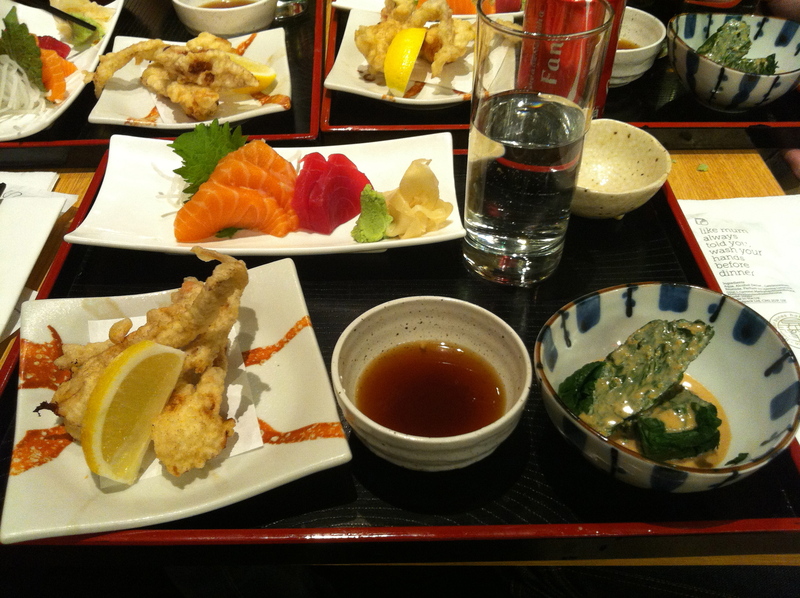 The starter consists of soft shell crab tempera, sashimi (3 slices of salmon; 2 slices of tuna) and spinach in peanut sauce. The crab was nice – could be a tad crispier though. Sashimi-wise, very standard: nothing to brag about. I really enjoyed the spinach in peanut sauce though (maybe because I’m a fan of the spinach and peanut). Both flavours go together really well and the sauce was really flavourful. In all, definitely a bang for your buck and a far better choice than the matcha cheesecake, however delicious it might be. For my ramen, I chose the new matcha ganso tonkotsu flavoured broth. Maybe because I had forgone the matcha cheesecake, I sub-consciously wanted some matcha in the ramen to make up for it. True enough, my ramen was undeniably filled with matcha: the noodles were all green in colour which looked like little snakes swimming in the broth. Though visually intriguing, they do not taste out of the ordinary. 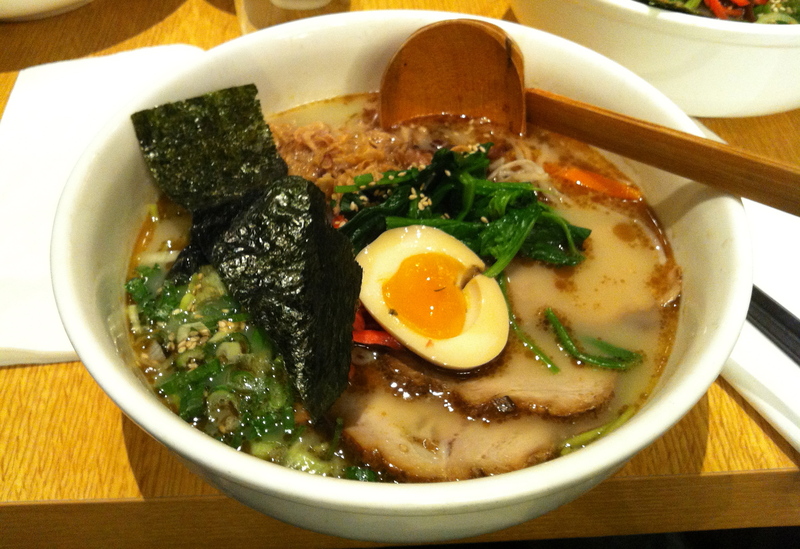 The broth was good as usual and lived up to Shoryu’s name: thick and rich (unlike Bone Daddies. Shhh….) The only gripe I had was that they had put too much ingredients in my broth! My whole bowl was overcrowded with ginger, cabbage, beansprouts, you name it! Sometimes you inadvertently bite into a piece of ginger and it just overpowers everything. And finding the pork slices was like a search for needles in a haystack! If any Shoryu cook is reading this: GO EASY ON THE VEGGIES! That said, your broth is probably the best I’ve tasted so far so kudos to you. 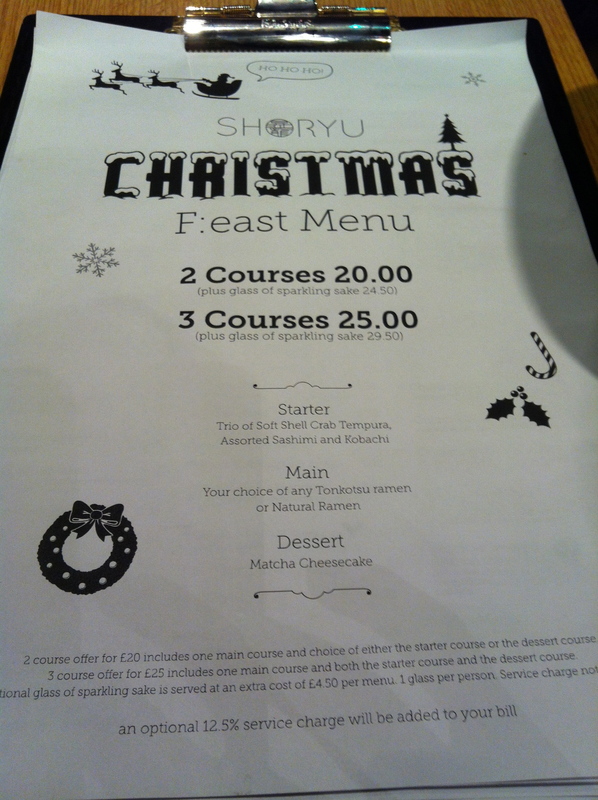 On the whole, please do check out Shoryu’s Christmas menu if you’re craving some ramen (I mean, who doesn’t?). Forget Hare & Tortoise, Wagamama or Bone Daddies. For £20 at Shoryu, you get soft shell crab tempura, fresh sashimi and a nice bowl of hot ramen, which arguably has the best broth in London. Perfect for winter.